Verizon has told the FCC, the public, or anyone else who will listen, that imposing 'utility-style regulations', sometimes referred to as 'Title II", on broadband providers -- will harm investment. What is Title II, Net Neutrality? Fact is: Verizon's entire financial plan for network deployment and investment is based on Title II, utility style regulation, today, and has been for time & memorial. To learn more see: "The Book of Broken Promises: $400 Billion Broadband Scandal & Free the Net"
We uncovered that Verizon's entire fiber optic deployments (that are being used for FiOS TV, for example) are all classified as "Title II" to get the utility benefits as well as charge local phone customers rate increases to fund these deployments. And even the basic information about Verizon's FiOS deployment and network construction is in question. While Verizon claims that it spent $23 billion on the FiOS deployment, there is no evidence of 'new construction' for FiOS. Instead, the funds are simply a restatement of monies coming out of the existing state utility budgets. As you may know, "Title II" is at the center of actions pertaining to the FCC's upcoming rules about something called Net Neutrality. Regardless of the FCC's decision on Net Neutrality and the use of Title II going forward, it is about the flows of money between and among Verizon's state-based utilities and Verizon's other lines of business that matter-- something neither the FCC or the states have focused on for at least a decade. We created a new report: Show Us the Money to detail these issues. We will start with some of the findings from PART I: Verizon's FiOS, Fiber Optic Investments, and Title II and there will be new sections added over the next few months. FACT 1: Verizon Fiber Optic Networks are Title II. Verizon's Fiber-to-the-Premises (FTTP) networks and other fiber optic deployments were constructed as Title II, common carriage networks, including the networks used for the FiOS cable TV and Internet services. "Verizon NJ has been upgrading its telecommunications facilities in large portions of its telecommunications service territory so that cable television services may be provided over these facilities. This upgrade consists of deploying fiber optic facilities directly to the subscriber premises. The construction of Verizon NJ's fiber-to-the-premises FTTP network (the FTTP network) is being performed under the authority of Title II of the Communications Act of 1934 and under the appropriate state telecommunications authority granted to Verizon NJ by the board and under chapters 3 and 17 of the Department of Public Utilities Act of 1948. The FTTP network uses fiber optic cable and optical electronics to directly link homes to the Verizon NJ networks... Pursuant to the NJSA 45:5A-15, telecommunication service providers currently authorized to provide service in New Jersey do not require approval to upgrade their facilities for the provision of cable television service." FACT 2: Verizon Uses Title II so That It Can Get the State-Based Utility Rights-of-Way and Charge Local Phone Customers for the Construction. The NYPSC press release explains that this 2009 rate increase was due to "massive deployment of fiber optics". Unfortunately, this was the third increase, adding 84% to local phone rates. starting in 2006. FACT 3: Where's the Beef? There Is No Evidence Verizon Spent $23 Billion in 'New Expenditures' for FiOS. "For example, in reliance on the Commission's decisions to refrain from applying utility-style regulation to new broadband networks and services, Verizon has invested more than $23 billion deploying our all-fiber FiOS network, and tens of billions more deploying mobile broadband facilities." The $23 billion in capital expenditures that was supposed to have been spent over a seven year period, 2005 to 2011, is nowhere to be found. We ask "Where's the Beef? ", to use an old advertising slogan. Over the last 22 years, 1993-2014, Verizon spent a great deal more money per year, on average, from 1993 through 2003 than it ever did from 2004-2014, much less the FiOS years, 2005-2011, and it is clear there has been a rapid decline of wireline expenditures in general since 2010. 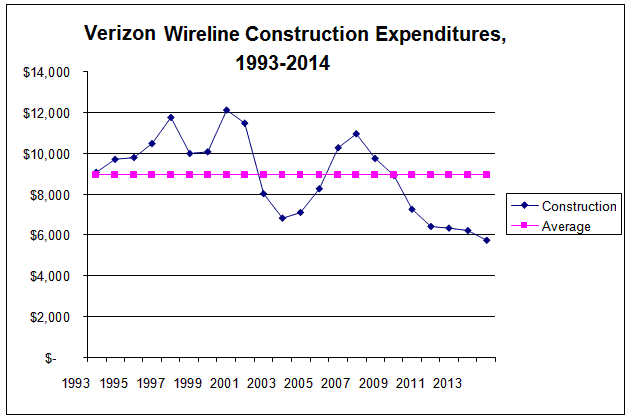 FACT 4: The FiOS Expenditures Were Part of the State Utility, Title II, Wireline Budgets. Simply put, Verizon's fiber network construction is coming out of the original construction budgets and those are classified as Title II, and these funds were supposed to be upgrading and maintaining the utility networks. As we show in the report (too technical to go into here), the majority of Verizon's costs for building and maintaining the networks (capital expenditures and network specific expenses) were paid out of construction that was dedicated to one primary category, 'local service', as opposed to the cable TV service paying for the construction, (which is classified as "Title VI"). And as previous Verizon NJ quote shows, Verizon does "not require approval to upgrade their facilities for the provision of cable television service". Simply put, while some argue that a fiber optic network can carry different 'services', like cable TV ('Title VI') or an Internet service, which is classified as an 'information service', 'Title I', these are "services", which ride over a physical network and they DID NOT fund the construction of the networks. FACT 5: Verizon Diverted Utility Construction Budgets for the Fiber Deployment of Its Affiliate Companies, Including Verizon Wireless, by Using Title II. Verizon New York's local service customers paid for, some, if not most of the construction of the fiber optic networks for cable TV, "special access" and wires used by Verizon Wireless to connect their the cell tower facilities. And this was facilitated because the construction is based on Title II. According to the NY Attorney General, about 75% of Verizon NY's wireline utility budget has been diverted to fund the construction of fiber optic lines that are used by Verizon Wireless's cell site facilities and FiOS cable TV. "Verizon New York's claim of making over a "billion dollars" in 2011 capital investments to its landline network is misleading. In fact, roughly three-quarters of the money was invested in providing transport facilities to serve wireless cell sites and its FiOS offering. Wireless carriers, including Verizon's affiliate Verizon Wireless, directly compete with landline telephone service and the company's FiOS is primarily a video and Internet broadband offering....Therefore, only a fraction of the company's capital program is dedicated to supporting and upgrading its landline telephone service." And the text states that the fiber optic connections to the cell towers for wireless services are a wired product. And we note that almost identical press releases have been used for years, not only in New York but in most of the Verizon states. FACT 6: Verizon's Manipulation of the Construction Budgets and Related Staff has Harmed Local Service Customers and Caused 'Quality of Service' Issues over the Last 5+ Years. 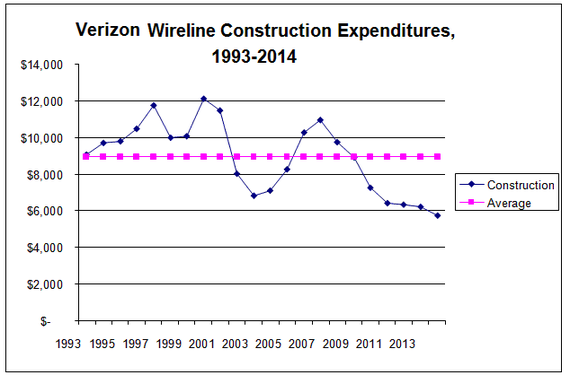 And here's one of the Title II punch-lines -- The investment in wireless (using Title II) has harmed the wireline customers. According to the NY Attorney General's Office, Verizon is reducing staff and focusing on wireless. "Rather than meet its obligations to provide wireline telephone customers with minimally adequate telephone service, Verizon is continuing to drastically reduce its workforce with the result that the company cannot meet its customers' repair needs in a timely manner. Verizon's management has demonstrated that it is unwilling to compete to retain its wireline customer base, and instead is entirely focused on expanding its wireless business affiliate." "Verizon's own actions have demonstrated a disinterest in continuing to compete for wireline customers or invest in traditional telephone service. Instead, the company's resources and management focus is concentrated on its wireless affiliate, to the detriment of Verizon's wireline customers." Conclusion: Verizon has never disclosed to the FCC, courts or the public how the company uses Title II today as the primary investment mechanism for the company's fiber optic network deployments, and neither the FCC nor the states have examined the flows of money among and between the Verizon subsidiaries. FACT 7: The Implications of Our Findings Extend Far Beyond Net Neutrality Concerns. By manipulating the construction budgets (as Title II), the company is able to build new lines of business -- at the expense of local phone customers. Verizon can make the claim that the networks are 'uneconomical' as the expenses are being inflated by these other lines of business. Verizon can raise rates continuously because the networks have been deemed uneconomical. By making this claim, Verizon has announced it is not expanding FiOS deployments and that its plan is to 'shut off the copper' (and force customers onto their wireless services). If Verizon stops deploying FiOS, it means that there is no 'high-speed Internet' competition (over 25 Mbps), much less cable TV competition in much of the Verizon territories. Ironically, Verizon has been doing all of this right under the nose of the FCC, who hasn't audited the companies' financials for over a decade and stopped even collecting basic financial information since 2007. And if the FCC does impose Title II, though it will be taken to court, at the end of the day, it does not address or fix what we uncovered. However, what we found can be used to create change -- as this information is based entirely on facts and the actual use of Title II today... not some speculative future next step.